The newly-renovated Hilton Kauai Beach Resort is making a splash with its new 75-foot flume and lava tube waterslide, and the resort is inviting kamaaina to experience the resort and all its amenities first-hand with a "Kamaaina Splash" special. The Kamaaina Splash offers deluxe accommodations and daily buffet breakfast for two in the resort's Naupaka Terrace at $139 per night (plus taxes and daily resort fee). The offer is available for stays through June 30 and cannot be combined with any other package or discount offer. A Hawaii driver's license is required for identification. Guests can enjoy a nightly sunset cocktail hour, followed by a torch-lighting ceremony and Polynesian dance show. Complimentary shuttle service is available for guests headed to and from the airport and nearby golf courses. Call 1-800-HILTONS at (808) 245-1955 or visit www.hiltonkauairesort.com. 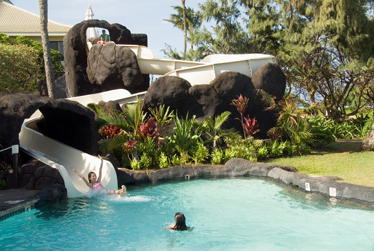 The Hilton Kauai Beach Resort flume and lava-tube waterslide will keep the kids entertained on your next Kauai stay. "Exploring Oahu," a new interactive online guide, offers a fun, easy way to see Oahu this summer. The guide takes you around the island via 10 stops, each designed to teach about some of its most culturally and historically significant sites. The tour starts at Diamond Head State Monument, traverses Makapuu Overlook to Kailua Beach Park, then up to Nuuanau Pali State Park, down to Heeia State Park, around the bend to Kualoa Regional park, past Laniloa Point and Pupukea Beach Park, ending on the Waianae coast. The guide, developed by Moanalua Gardens Foundation, was made possible through a Hawaii Tourism Authority grant. MGF annually reaches 4,000 keiki a year through its Partners in Education Program, teaching them respect for the aina. Find the guide at http://www.mgf-hawaii.org.